We're top 3 attraction in our district and rated Excellent on TripAdvisor page! Reach us now from London, Brussels or Frankfurt! From only 16.99 Euro per flight. We will pick you up at the airport and offer accommodation for the first-last night if needed! Traveling in cold weather conditions can be life threatening. The information provided here is designed for educational use only and is not a substitute for specific training or experience. Princeton University and the author assume no liability for any individual's use of or reliance upon any material contained or referenced herein. Medical research on hypothermia and cold injuries is always changing knowledge and treatment. When going into cold conditions it is your responsibility to learn the latest information. The material contained in this workshop may not be the most current. Radiation - loss of heat to the environment due to the temperature gradient (this occurs only as long as the ambient temperature is below 98.6). Factors important in radiant heat loss are the surface area and the temperature gradient. Water conducts heat away from the body 25 times faster than air because it has a greater density (therefore a greater heat capacity). Stay dry = stay alive! Example: Generally conductive heat loss accounts for only about 2% of overall loss. However, with wet clothes the loss is increased 5x. Convection - is a process of conduction where one of the objects is in motion. Molecules against the surface are heated, move away, and are replaced by new molecules which are also heated. The rate of convective heat loss depends on the density of the moving substance (water convection occurs more quickly than air convection) and the velocity of the moving substance. Wind Chill - is an example of the effects of air convection, the wind chill table gives a reading of the amount of heat lost to the environment relative to a still air temperature. It is important to recognize the strong connection between fluid levels, fluid loss, and heat loss. As body moisture is lost through the various evaporative processes the overall circulating volume is reduced which can lead to dehydration. This decrease in fluid level makes the body more susceptible to hypothermia and other cold injuries. 1. Heat is both required and produced at the cellular level. The environment acts as either a heating or a cooling force on the body. The body must be able to generate heat, retain heat, and discharge heat depending on the body activity and ambient external temperature. 2. Body temperature is a measure of the metabolism - the general level of chemical activity within the body. 3. The hypothalamus is the major center of the brain for regulating body temperature. It is sensitive to blood temperature changes of as little as 0.5 degrees Celsius and also reacts to nerve impulses received from nerve endings in the skin. 4. The optimum temperature for chemical reactions to take place in the body is 98.6 degrees F. Above 105 F many body enzymes become denatured and chemical reactions cannot take place leading to death. Below 98.6 F chemical reactions slow down with various complications which can lead to death. 5. Core = the internal body organs, particularly the heart, lungs, and brain. Periphery = the appendages, skin, and muscle tissue. 6. Core temperature is the temperature that is essential to the overall metabolic rate of the body. The temperature of the periphery is not critical. 1. Vasodilation - increases surface blood flow, increases heat loss (when ambient temperature is less that body temperature). Maximal vasodilation can increase cutaneous blood flow to 3000 ml/minute (average flow is 300-500 ml/minute). 2. Vasoconstriction - decreases blood flow to periphery, decreases heat loss. Maximal vasoconstriction can decrease cutaneous blood flow to 30 ml/minute. 4. Shivering - generates heat through increase in chemical reactions required for muscle activity. Visible shivering can maximally increase surface heat production by 500%. However, this is limited to a few hours because of depletion of muscle glucose and the onset of fatigue. 5. Increasing/Decreasing Activity will cause corresponding increases in heat production and decreases in heat production. Wetnesst to rewarm the body. Any temperature less than 98.6 degrees can be linked to hypothermia (ex. hypothermia in the elderly in cold houses) or peripheral circulation problems such as trench foot and frostbite. at 90 degrees the body tries to move into hibernation, shutting down all peripheral blood flow and reducing breathing rate and heart rate. at 86 degrees the body is in a state of "metabolic icebox." The person looks dead but is still alive. The person may be curled up in a fetal position. Try to open their arm up from the fetal position, if it curls back up, the person is alive. Dead muscles won't contract only live muscles. Moderate Hypothermia 95º - 93ºF Shivering, intense, muscle incoordination becomes apparent, movements slow and labored, stumbling pace, mild confusion, may appear alert. Use sobriety test, if unable to walk a 30 foot straight line, the person is hypothermic. 93º - 90ºF Violent shivering persists, difficulty speaking, sluggish thinking, amnesia starts to appear, gross muscle movements sluggish, unable to use hands, stumbles frequently, difficulty speaking, signs of depression, withdrawn. 78º - 75ºF Pulmonary edema, cardiac and respiratory failure,death. Death may occur before this temperature is reached. The basic principles of rewarming a hypothermic victim are to conserve the heat they have and replace the body fuel they are burning up to generate that heat. If a person is shivering, they have the ability to rewarm themselves at a rate of 2 degrees C per hour. It is essential to keep a hypothermic person adequately hydrated and fueled. Hypothermia Wrap: The idea is to provide a shell of total insulation for the patient. No matter how cold, patients can still internally rewarm themselves much more efficiently than any external rewarming. Make sure the patient is dry, and has a polypropylene layer to minimize sweating on the skin. The person must be protected from any moisture in the environment. Use multiple sleeping bags, wool blankets, wool clothing, Ensolite pads to create a minimum of 4" of insulation all the way around the patient, especially between the patient and the ground. Include an aluminum "space" blanket to help prevent radiant heat loss, and wrap the entire ensemble in plastic to protect from wind and water. If someone is truly hypothermic, don't put him/her naked in a sleeping bag with another person. Warm Sugar Water - for people in severe hypothermia, the stomach has shut down and will not digest solid food but can absorb water and sugars. Give a dilute mixture of warm water with sugar every 15 minutes. Dilute Jello™ works best since it is part sugar and part protein. This will be absorbed directly into the blood stream providing the necessary calories to allow the person to rewarm themselves. One box of Jello = 500 Kilocalories of heat energy. Do not give full strength Jello even in liquid form, it is too concentrated and will not be absorbed. Urination - people will have to urinate from cold diuresis. Vasoconstriction creates greater volume pressure in the blood stream. The kidneys pull off excess fluid to reduce the pressure. A full bladder results in body heat being used to keep urine warm rather than vital organs. Once the person has urinated, it precious body heat will be used to maintain the temperature of vital organs. So in the end urinating will help conserve heat. You will need to help the person urinate. Open up the Hypothermia Wrap enough to do this and then cover them back up. You will need to keep them hydrated with the dilute Jello solution described above. Heat can be applied to transfer heat to major arteries - at the neck for the carotid, at the armpits for the brachial, at the groin for the femoral, at the palms of the hands for the arterial arch. Chemical heat packs such as the Heat Wave™ provides 110 degrees F for 6-10 hours. For a severely hypothermic person, rescue breathing can increase oxygen and provide internal heat. Is a situation in which the core temperature actually decreases during rewarming. This is caused by peripheral vessels in the arms and legs dilating if they are rewarmed. This dilation sends this very cold, stagnate blood from the periphery to the core further decreasing core temperature which can lead to death. In addition, this blood also is very acetic which may lead to cardiac arrythmias and death. Afterdrop can best be avoided by not rewarming the periphery. Rewarm the core only! Do not expose a severely hypothermic victim to extremes of heat. Tissue temperature in cold weather is regulated by two factors, the external temperature and the internal heat flow. 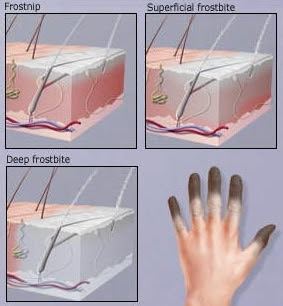 All cold injuries described below are intimately connected with the degree of peripheral circulation. As peripheral circulation is reduced to prevent heat loss to the core these conditions are more likely to occur. 2. Cold-induced Vasodilation - When a hand or foot is cooled to 59 degrees F, maximal vasoconstriction and minimal blood flow occur. If cooling continues to 50 degrees, vasoconstriction is interrupted by periods of vasodilation with an increase in blood and heat flow. This "hunting" response recurs in 5-10 minute cycles to provide some protection from cold. Prolonged, repeated exposure increases this response and offers some degree of acclimatization. Ex. Eskimos have a strong response with short intervals in between. 3. Pathophysiology of Tissue Freezing - As tissue begins to freeze, ice crystals are formed within the cells. As intracellular fluids freeze, extracellular fluid enters the cell and there is an increase in the levels of extracellular salts due to the water transfer. Cells may rupture due to the increased water and/or from tearing by the ice crystals. Do not rub tissue; it causes cell tearing from the ice crystals. As the ice melts there is an influx of salts into the tissue further damaging the cell membranes. Cell destruction results in tissue death and loss of tissue. Tissue can't freeze if the temperature is above 32 degrees F. It has to be below 28 degrees F because of the salt content in body fluids. Distal areas of the body and areas with a high surface to volume ratio are the most susceptible (e.g ears, nose, fingers and toes - this little rhyme should help remind you what to watch out for in yourself and others). Surface frostbite generally involves destruction of skin layers resulting in blistering and minor tissue loss. Blisters are formed from the cellular fluid released when cells rupture. Circulation is reduce to the are to prevent heat loss. The area may be pale, cold. It may have sensation or be numb. Rewarming is accomplished by immersion of the effected part into a water bath of 105 - 110 degrees F. No hotter or additional damage will result. This is the temperature which is warm to your skin. Monitor the temperature carefully with a thermometer. Remove constricting clothing. Place the appendage in the water and continue to monitor the water temperature. This temperature will drop so that additional warm water will need to be added to maintain the 105 - 110 degrees. Do not add this warm water directly to the injury. The water will need to be circulated fairly constantly to maintain even temperature. The effected appendage should be immersed for 25 - 40 minutes. Thawing is complete when the part is pliable and color and sensation has returned. Once the area is rewarmed, there can be significant pain. Discontinue the warm water bath when thawing is complete. Do not use dry heat to rewarm. It cannot be effectively maintained at 105 - 110 degrees and can cause burns further damaging the tissues. Once rewarming is complete the injured area should be wrapped in sterile gauze and protected from movement and further cold. Once a body part has been rewarmed it cannot be used for anything. Also it is essential that the part can be kept from refreezing. Refreezing after rewarming causes extensive tissue damage and may result in loss of tissue. If you cannot guarantee that the tissue will stay warm, do not rewarm it. Mountaineers have walked out on frozen feet to have them rewarmed after getting out with no tissue loss. Once the tissue is frozen the major harm has been done. Keeping it frozen will not cause significant additional damage. If the person is hypothermic and frostbitten, the first concern is core rewarming. Do not rewarm the frostbitten areas until the core temp approaches 96 degrees. Liquids such as white gas can "supercool" in the winter (drop below their freezing point but not freeze). White gas also evaporates quickly into the air. Spilling supercooled white gas on exposed skin leads to instant frostbite from evaporative cooling. Always were gloves when handling fuel. Touching metal with bare skin can cause the moisture on your skin to freeze to the metal. (In really cold conditions, metal glasses frames can be a problem). When you pull away, you may leave a layer of skin behind. Don't touch metal with bare skin. Trench foot is a process similar to chillblains. It is caused by prolonged exposure of the feet to cool, wet conditions. This can occur at temperatures as high as 60 degrees F if the feet are constantly wet. This can happen with wet feet in winter conditions or wet feet in much warmed conditions (ex. sea kayaking). The mechanism of injury is as follows: wet feet lose heat 25x faster than dry, therefore the body uses vasoconstriction to shut down peripheral circulation in the foot to prevent heat loss. Skin tissue begins to die because of lack of oxygen and nutrients and due to buildup of toxic products. The skin is initially reddened with numbness, tingling pain, and itching then becomes pale and mottled and finally dark purple, grey or blue. The effected tissue generally dies and sluffs off. In severe cases trench foot can involve the toes, heels, or the entire foot. If circulation is impaired for > 6 hours there will be permanent damage to tissue. If circulation is impaired for > 24 hours the victim may lose the entire foot. Trench Foot cuases permanent damage to the circulatory system making the person more prone to cold related injuries in that area. A similar phenomenon can occur when hands are kept wet for long periods of time such as kayaking with wet gloves or pogies. The damage to the circulatory system is known as Reynaud's Phenomenon. Includes careful washing and drying of the feet, gentle rewarming and slight elevation. Since the tissue is not frozen as in severe frostbite it is more susceptible to damage by walking on it. Cases of trench foot should not walk out; they should be evacuated by litter. Pain and itching are common complaints. Give Ibuprofen or other pain medication. Prevention is the best approach to dealing with trench foot. Keep feet dry by wearing appropriate footwear. Check your feet regularly to see if they are wet. If your feet get wet (through sweating or immersion), stop and dry your feet and put on dry socks. Periodic air drying, elevation, and massage will also help. Change socks at least once a day and do not sleep with wet socks. Be careful of tight socks which can further impair peripheral circulation. Foot powder with aluminum hydroxide can help. High altitude mountaineers will put antiperspirant on their feet for a week before the trip. The active ingredient, aluminum hydroxide will keep your feet from sweating for up to a month and their are no confirmed contraindications for wearing antiperspirant. [Some studies have shown links between alumnium in the body and Alzheimers.] Vapor barrier socks may increase the possibility of trenchfoot. When you are active and you are wearing a vapor barrier sock, you must carefully monitor how you sweat. If you are someone who sweats a lot with activity, your foot and polypropylene liner sock may be totally soaked before the body shuts down sweating. Having this liquid water next to the skin is going to lead to increased heat loss. If you don’t sweat much, your body may shut down perspiration at the foot before it gets actually wet. This is when the vapor barrier system is working. You must experiment to determine if vapor barrier systems will work for you. If at any time you discover a cold injury, stop and rewarm the area (unless doing so places you at greater risk). Treatment is very controlled, rapid rewarming e.g. placing a warm hand or compress over the closed eye. After rewarming the eyes must be completely covered with patches for 24 - 48 hours. blindness can even occur during a snow storm if the cloud cover is thin. 1. Make sure you do a complete assessment of heart rate before beginning CPR. Remember, the heart rate may be 2-3/minute and the breathing rate 1/30 seconds. Instituting cardiac compressions at this point may lead to life-threatening arrythmias. Check the carotid pulse for a longer time period (up to a minute) to ascertain if there is some slow heartbeat. Also, even though the heart is beating very slowly, it is filling completely and distributing blood fairly effectively. External cardiac compressions only are 20-30% effective. Thus, with its severely decreased demands, the body may be able to satisfy its circulatory needs with only 2-3 beats per minute. Be sure the pulse is absent before beginning CPR. You will need to continue to do CPR as you rewarm the person. 2. Ventilation may have stopped but respiration may continue - the oxygen demands for the body have been so diminished with hypothermia that the body may be able to survive for some time using only the oxygen that is already in the body. If ventilation has stopped, artificial ventilation may be started to increase available oxygen. In addition, blowing warm air into the persons lungs may assist in internal rewarming. If pulse but not breathing or slow breathing, give rescue breathing (also adds heat).